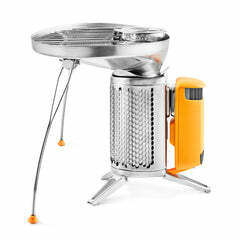 Fire up the CampStove 2 to cook meals and charge devices with nothing but the sticks around you. 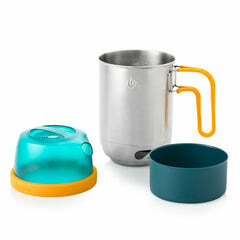 Up your culinary game with the included Portable Grill and KettlePot, lightweight cooking accessories that can brew your morning coffee or grill up a wood-fired feast. Keep your site lit with the PowerLight, a 3-in-1 lantern, torch and powerbank plus the SiteLight and SiteLight XL, packable daisy-chaining stringlights for instant overhead lighting. BONUS: The Energy Bundle+ upgrades to the SolarPanel 5+, a 5 watt solar panel with 2200 mAh of battery storage that gets you the most from the sun. Keep your group well-fed, your gear fully charged, and your site perfectly lit. 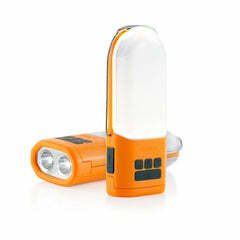 Functional task lights meet social ambient lighting - who said sundown was the end of the day?